TASRAIL is on track to capture 60 per cent of the contestable road and rail freight market by the end of 2015-16, in a surprise turnaround for the state-owned business. On the high volume Burnie-to-Brighton corridor, Tasrail now carries 68 per cent of the freight volume compared to 32 per cent travelling by road. And on the statewide figure, which includes areas where rail is not an option, Tasrail will increase its volume by five per cent to 27 per cent by the end of this financial year, following a new bauxite contract to Bell Bay. When Tasrail was created with the departure of rail management company Pacific National in 2009, the tonnage was estimated at 11 to 12 per cent. Scheme starting January 1 next year. The federal government extended the scheme to include exported products and increased funding by $50 million for the next four years. The Tasmanian Business Reporter also understands that Tasrail is taking a flexible approach to attracting increased volumes of product from the state’s booming agriculture sector, thanks to overseas markets and a vastly expanded irrigation scheme statewide. Consistent with Tasrail’s proactive approach to future opportunities, it recently released a commissioned report on the value and benefits of freight rail in Tasmania. Moving freight by rail rather than road could deliver an estimated $159 million in savings to the state’s economy over the next five years, according to the study. In 2013-14 alone, the benefits of rail freight are worth approximately $26 million to the Tasmanian community. The study, commissioned in January this year and undertaken by leading infrastructure consultants Pitt&Sherry, shows savings can be generated by reducing costs related to road accidents, pollution and road maintenance, as well as the operating costs of industry and commerce. TasRail chief executive Damien White said the purpose of the study was to quantify the underlying benefits of the state’s rail freight system, at a time when it was enjoying significant growth. 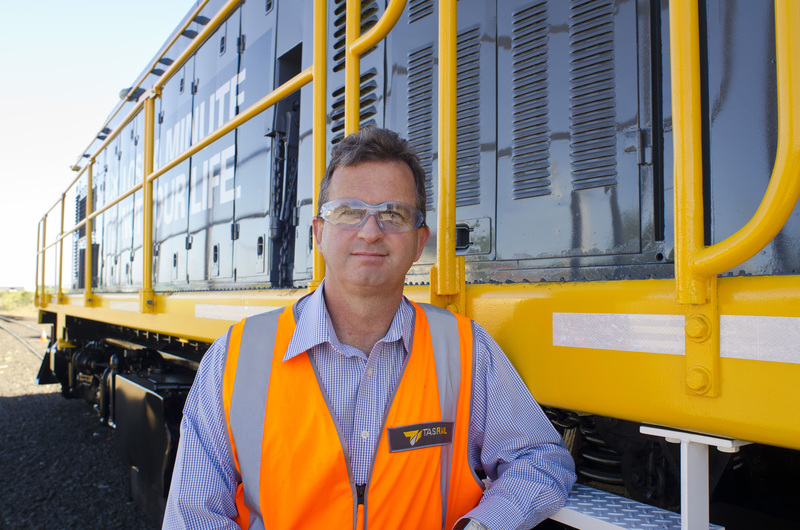 “The study highlights one of TasRail’s important competitive advantages – which is to help industries strengthen their social licences by moving freight by rail rather than by road – is providing vital social, environmental and economic benefits,” Mr White said. ● up to $9 million in the operating costs of business and industry. These savings were forecast to rise over the five year period to June 30, 2019 and continue well into the future. Mr White said the essence of the study’s findings was that on major freight corridors, such as between Brighton and Burnie, rail was the most efficient freight mode. “While there is an investment cost in rail – as there is with roads and shipping – it delivers state wide benefits that are significantly greater than the investment costs,” Mr White said. Mr White said the study concluded that rail freight was a safe freight mode, with a lower accident incidence than road – and therefore smaller accident costs. “Greenhouse emissions are lower, reducing environmental costs and using rail rather than road reduces heavy vehicle trips, in turn reducing road damage and therefore road maintenance costs,” he said. “The result is an overall increase in Tasmania’s transport system efficiency, delivering lower costs in two major ways.